Study the many mysteries of outer space with the Space Exploration Carry Case. Inside this large take-along case is the opportunity for your youngster to use their imagination and explore as an astronaut would, thanks to the space rover equipped with satellite and other gear. Use the claw tool to pick up and space rocks to take with you for research. When playtime is over, simply store the pieces inside the case for next time! 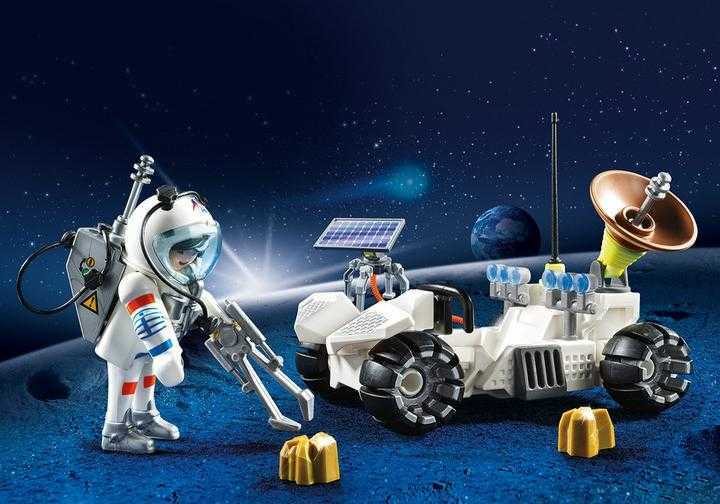 Set includes one astronaut, moon racer, space rocks, and other accessories. De Space Exploration Carry Case (9101) Playmobil set is op voorraad bij onderstaande site. Ze hebben echter besloten niet naar de door jouw gekozen lokatie uit te leveren. De Space Exploration Carry Case (9101) Playmobil set is niet meer direct leverbaar door onderstaande sites. Vaak echter kunnen toeleveranciers of andere wederverkopers op deze sites de set nog wel leveren, zie daarvoor "Meer..."..